This is the third design of the serie “Deruta by GPA” inspired by old maiolica/pottery designs of Deruta art. 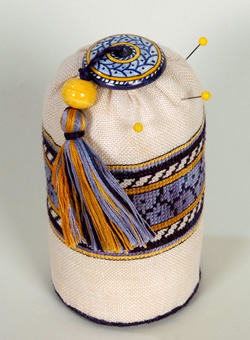 D3 kit: Flat button GB and Small yellow Fuseruola (pottery bead) by “Academy of Deruta Work”. Other finishing supplies: polyfill, interfacing, cardboard, blue felt, blue and sand sewing thread, matching pins, stick glue and hot glue gun.